The Seabourn Odyssey Veranda Suite is ultra-spacious and stylish. It has a modern Nordic decor as well as a range of clever design features that are sure to please. With style, luxury and a genuine teak veranda we rate is as one of the best rooms at sea. The Seabourn Odyssey Veranda Suite is the most popular type of room onboard and it’s easy to see why. These ultra-spacious suites offer every comfort. Also, they boast a genuine teak veranda – a real luxury these days and something that’s not available on the newer Seabourn ships. How does it compare with the new Seabourn Ovation veranda suite? The Seabourn Odyssey’s Veranda Suites are located midship as well as forward, and are spread over six passenger decks. So this keeps them well away form the dining areas, bars and the show lounge which means there is no noise disturbance. A stewardess looks after each suite, servicing it twice daily. She will also ensure fresh fruit is provided and make sure you never run out of bath products! Guests can choose from a selection of bathroom amenities, including hypoallergenic products. In addition, there is a pillow menu with something to suit just about every preference. The layout of the Seabourn Odyssey Veranda Suite was revolutionary when it debuted in 2009. Each one has 28 sq. m. / 302 sq. ft. of internal space, in addition to a genuine teak veranda measuring 6-7 sq. m. / 68-83 sq. ft. The spacious layout of the Seabourn Odyssey Veranda Suite. There is a wide entry hall that runs down one side. It has a vanity area and makeup mirror. A luxurious marble bathroom and a walk-in closet are both accessed from the hall too. The living space is divided into two distinct zones. There is a bedroom at one end and a comfortable sitting/dining area at the other. Floor-to-ceiling glass doors lead on to the luxurious teak veranda. Knowing the best positioned Seabourn Odyssey Veranda Suites can really improve your cruise experience. There are 166 Veranda Suites spread across six passenger decks, from deck 5 to 10. Deck 6 has the most Veranda Suites – there are 56 of them – while deck 7 has a total of 42 suites. All the other decks have significantly fewer. Veranda Suites are positioned midship and forward. For the ultimate in privacy we recommend one of the Veranda Suites on decks 9 or 10 (the Penthouse decks). These suites (924 and 1024) are slightly smaller (with 26.6 sq. m. / 286 sq. ft. of internal space), however, they have a preferential location and the bonus of sharing the exclusive Penthouse deck ambiance. There are 6 categories (V1 to V6) of Seabourn Odyssey Veranda Suites. Seabourn sell them accordingly with V1 being the cheapest and V6 the most expensive. It’s worth noting that while the prices may vary, the layout of the suites themselves are identical. The suites in categories V1 to V4 are located forward, or on lower decks. In contrast, V5 and V6 suites have a preferred midship or high deck location. The veranda railings on V1 and V2 category suites on deck 5 are part metal, part glass from floor to teak rail. While all other suite categories have full glass veranda railings from floor to teak rail. The living area is where the Seabourn Odyssey Veranda Suite really shines. It has a minimalist Nordic-inspired decor with beautiful beechwood timber fixtures as well as a soothing palette of dove grey and cream. There are also splashes of colour in the artwork and throw cushions. 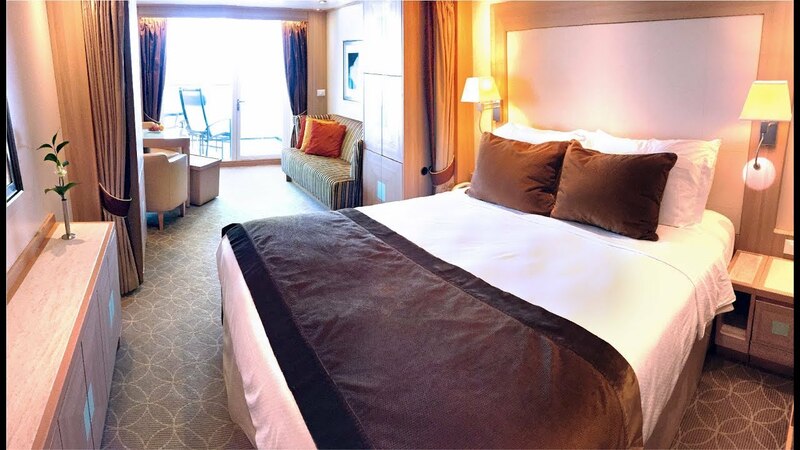 The Seabourn Odyssey Veranda Suite has sitting and sleeping areas. There are two distinct zones in the living space: A calming sleeping area as well as a tastefully decorated sitting/dining space. In the sleeping area you can choose a queen or twin bed setup. The mattress is exceptionally comfortable and you can also select either a duvet or blanket, depending on the climate. The bed is framed by a leather bedhead and there are attractive bedside lamps as well as multidirectional reading lights. On each side of the bed are nightstands with ingeniously design split-level drawers so you can store reading glasses or other little items. Also, there is a special book compartment for bedside reading material. Separating the sleeping and sitting areas are two unobtrusive, beechwood timber cabinets. These provide a visual divide between the two zones. One contains the mini-bar while the other has the entertainment unit. However, the flat-screen TV is dispassionately small. The minimalist approach continues in the sitting area. Indeed, there is no clutter, just a full sized 2-seat dining table on one side of the suite and a large sofa on the other. There’s plenty of room to move about in between. If needed a cleverly designed ottoman doubles as a coffee table with the use of a fitted tray top. Perhaps the highlight of the Seabourn Odyssey Veranda Suite is the genuine teak veranda itself. Teak verandas are a real luxury these days, in fact the newer Seabourn ships have faux teak verandas in all but the top suites. Seabourn Odyssey’s teak verandas are a real luxury. The veranda is wide and very deep with plenty of room for the outdoor furniture that includes a table, armchairs and ottomans. Each veranda is also very private. It should be noted that the verandas on decks 4 and 5 are partially enclosed. So rather than floor to railing glass they are part metal, part glass from floor to teak rail. The large marble bathroom in the Seabourn Odyssey Veranda Suite really impresses. It is clad in light and dark grey marble and has gleaming chrome taps. The large marble bathroom really impresses. The bathroom boasts a full sized bath tub as well as a separate shower. There is also a tight fitting glass shower door which ensures there are no splashes or leaks. In addition, there are deep double vanities and plenty of storage space around and below them. The view from above showing lots of room around the double vanity. Hermès soap is included in initial bathroom setup, however this is replaced by Molton Brown spa products throughout the voyage. Luxurious bath products by Molton Brown. There is lots of storage space in the Seabourn Odyssey Veranda Suite. A walk-in closet has hanging space for at least two cases full of clothing. There are also deep drawers as well as shelving for other personal items. The closet in the Veranda Suite has lots of hanging space. There is more storage space in the sideboard cabinet opposite the foot of the bed, as well as in the beechwood timber cabinets in the living space. Large pieces of luggage easily fit underneath the bed. Choice of pillows to suit your preference. Spacious seating area with expansive ocean view. A selection of designer soaps. Interactive flat-screen TV with music and movies. Walk-in closet with personal safe. Writing desk with personalised stationery. Laundry and dry cleaning service (at charge). Has anyone travelled in cabin 602. It’s all there is left, have read mixed reviews….. we like quiet in our cabin. Never travelled with seabourne, but fans of windstar, oceanea, cunard, silversea. Thanks for your kind feedback. It’s always appreciated. Suite 602 onboard Seabourn Odyssey is right at the front of the ship, just behind the Owners Suite. The suite itself is identical to almost every other veranda suite, however you will hear the noise of the anchor dropping on those mornings when the ship is at anchor. It can be loud – in fact you are not likely to be able to sleep through it! It’s also worth nothing that all the suites near the front of the ship are prone to movement in high seas. This is the case on any cruise ship. So if you suffer from seasickness I’d recommend getting a midship suite.